New 2018 Color Chart pdf, Free Download! Have a glorious day! Still waiting on my shipping notice for all the new color stuff (the design team got samples to make previews for you, but I had to go grab full packs and cubes!) and I promise it will be worth the wait! Gina K. Designs 2018 New Colors Release! I got so much wonderful feedback from you all after posting my video last week with Fabulous Flowers (almost sold out, but we can order more! 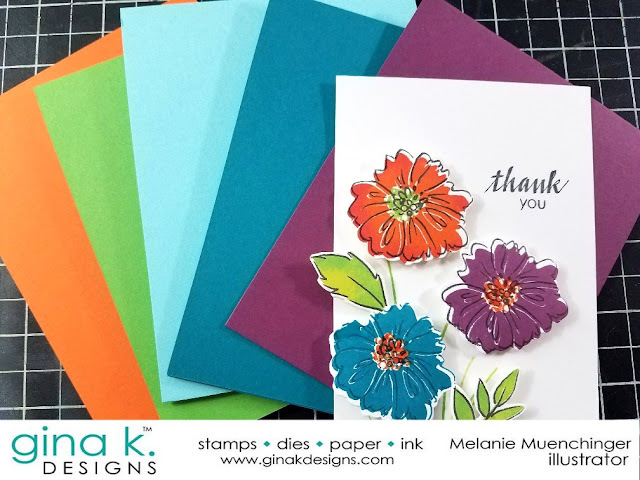 ), so I wanted to get out the coordinating sets A Year of Flowers 2 and Pressed Flowers 2 to test drive the new hot colors on these year round bold florals and their line art 2 steps! 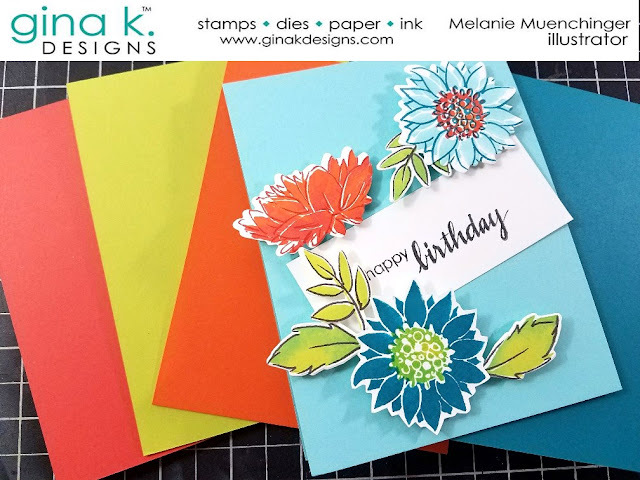 After stamping out several flowers and leaves in a variety of colors and combinations, I die cut them with the A Year of Flowers 2/Pressed Flowers 2 die set (the one die set cuts both sets of stamps) and laid them out in some different ways to make three designs for today. 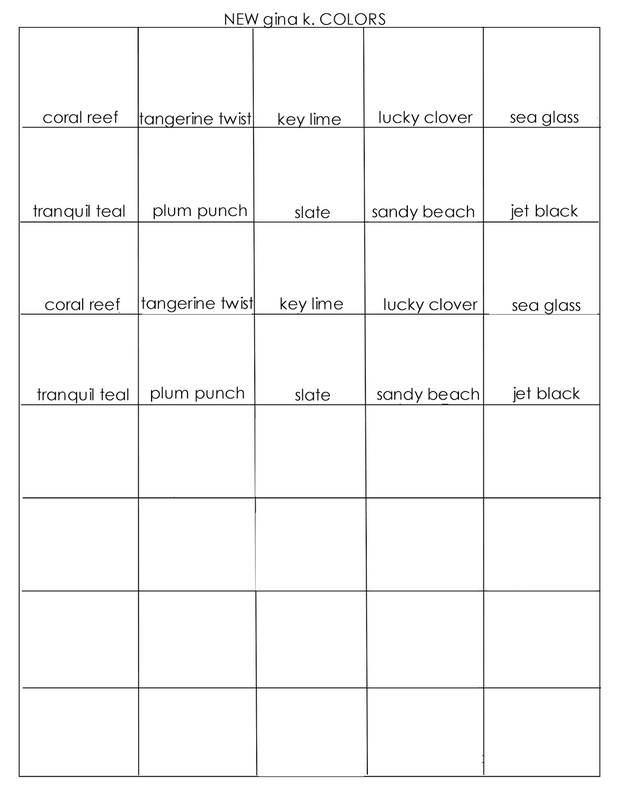 Stamped in Sea Glass, Tranquil Teal, Tangerine Twist, Key Lime, Lucky Clover, and Coral Reef shown, with their coordinating cardstocks. I used the new Slate ink to stamp the line art over the bold leaf images, for a pop a little more subtle than black but more defined than tone on tone, which I did with the flowers stamping bold in Sea Glass and Tangerine Twist, and line art with Tranquil teal and Coral Reef on top. There are so many ways to mix these sets and colors! Notice, too, the variation of green on the leaves! They are inked in Key Lime and rolled in Lucky Clover, the two blend so beautifully! Sentiment stamped in Amalgam. Stamped in Tangerine Twist, Plum Punch, Tranquil Teal and Lucky Clover, shown with their coordinating cardstocks. Slate outlines, once again! Sentiment stamped in Amalgam. 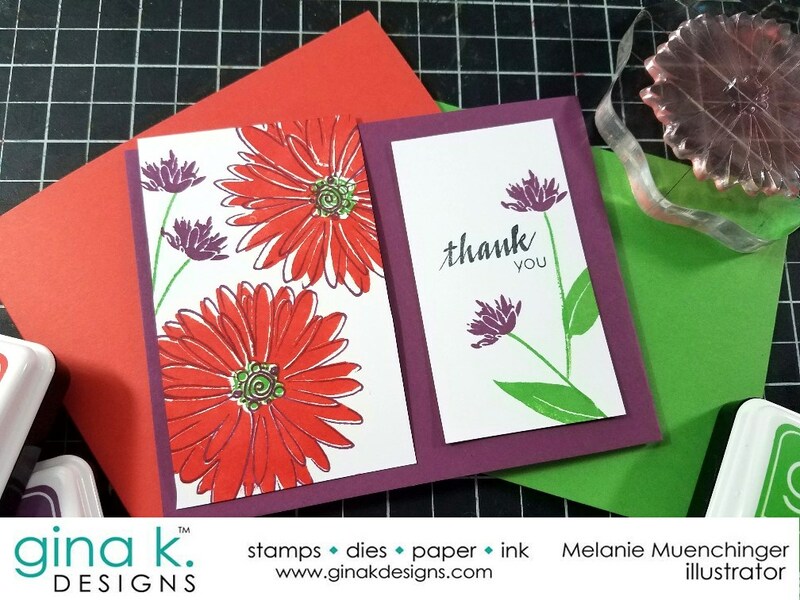 Stamped in Coral Reef, Plum Punch, and Lucky Clover, shown with their coordinating cardstocks. I LOVE the contrast of this plum outline over these bright coral flowers, really striking in real life! Sentiment stamped in Amalgam. Hope these clean and simple designs inspire!! Now I was going to do a video for this hop, but my kids have been passing around stomach virus cooties since last FRIDAY (yes, right after my birthday, I sure appreciated that!) so between laundry (oh, so much laundry) and holding hands, and taking temps, and mopping brows, I have samples only for now, but I have a tip I want to share until I get one done! When you get your new colors, cut an A2 sized card or card front with *each* color and then instead of making cards with them (for now), keep them in a pile you can use to check which color will give you the most pop or subtle effect you are going for. Sometimes I spend more times choosing these final colors than I do the actual stamping! And, sometimes "your final answer" might surprise you because the combination of colors reflect a little differently off one another, no matter how good you are at visualizing! This works so much better (for me) than holding it up against a sample or a full sheet of cardstock. I intentionally haven't committed to a particular card base for each of the above (and may still add mats behind the focal points), because I want to know, which do you think you'd like best? 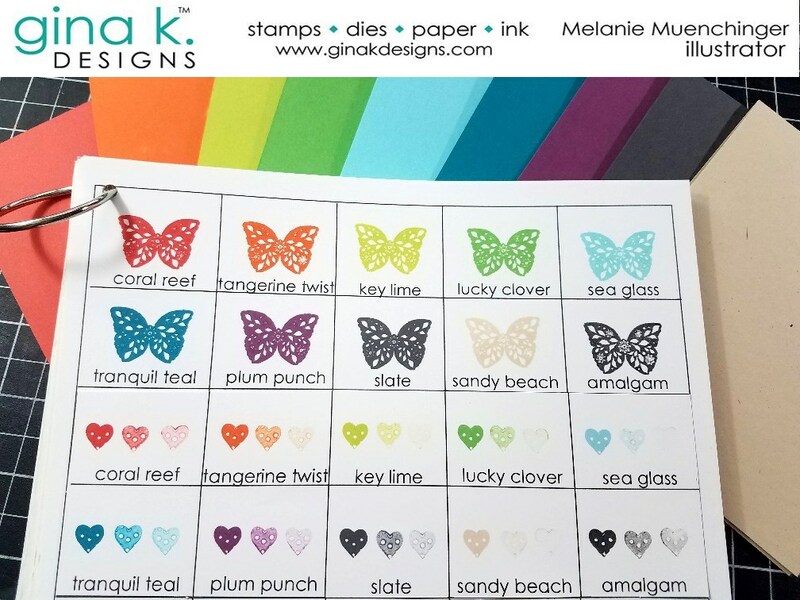 I also made up a new color chart with full strength (butterfly from Triple Play Frame) and stamped off versions (heart from Triple Play Fillers) of the 10 new inks, (8 new colors, plus Sandy Beach which coordinates with our current cardstock offerings), and the new "Amalgam", a fabulous black all purpose detail ink! I'll be demoing some coloring and other techniques with this versatile ink in upcoming videos, so stay tuned! Check out the collection below! 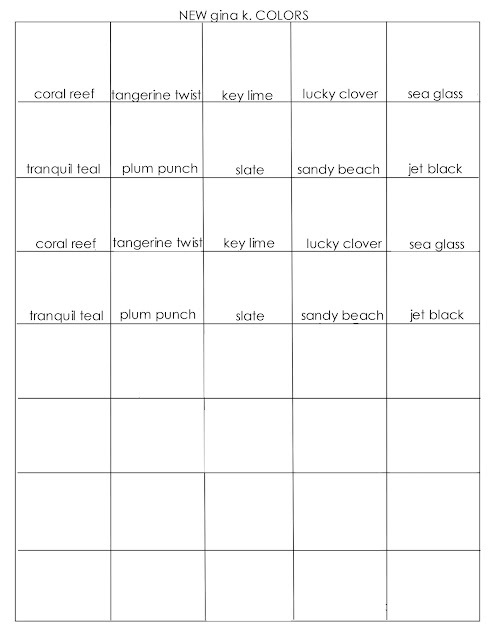 Coal Reef, Tangerine Twist, Key Lime, Lucky Clover, Sea Glass, Tranquil Teal, Plum Punch, and Slate! A really gorgeous, saturated full spectrum that is great for starting or expanding your collection! I love how they look together and am eager to mix them with our current offerings for new and fresh palettes! Oh, and cubes if you are so inclined! I'd play favorites buuuut I know you'll probably end up collecting them all. ;) My favorites are the Tranquil Teal and Plum Punch, because teal and plum are two of my favorite colors regardless, and because they are so unlike any other colors we currently have and I have been waiting literally years and YEARS for colors like these! I'm also freaking out to have some new greens, which are so bright and fun and will be so fabulous for LEAVES! Finally, the Sandy Beach and Slate are the most gorgeous neutrals, I will be using these ALL. THE TIME. I'll also show in my video comparisons with existing cardstock so you can see the differences more clearly. Looking forward to sharing!